This bills celebrates “THE SANCTITY OF MARRIAGE AND A LIFELONG UNION”! Excellent bridal gift or party favor. 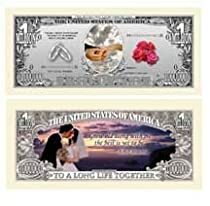 This Million Dollar Bill is simply stunning!